Traditional medicine has valued and used the countless properties of cinnamon and honey for centuries. These natural miracles offer a myriad of medicinal properties that help in the treatment of various health conditions. Honey is created by honeybees from plant nectar, and it is a rich source of glucose, carbohydrates, and fructose. It has powerful antibacterial, antioxidant and anti-inflammatory properties. Honey is also high in phenolic compounds, which are responsible for many of its beneficial effects. Cinnamon is a spice derived from the inner bark and leaves of several tree species that grow in China, Australia, India, Egypt, and Sri Lanka, and it also offers strong antimicrobial and antioxidant properties. Most of these are due to the presence of cinnamaldehyde, a major molecular compound in cinnamon. When combined together, despite the amazing delicious taste, these two contain complementary agents that work together to even more effectively resolve health issues. This mixture lowers the risk of heart disease, since it reverses several health signs that significantly raise that risk, such as high levels of “bad” low-density lipoprotein (LDL) cholesterol and high triglyceride levels, as well as high blood pressure and low levels of “good” high-density lipoprotein (HDL) cholesterol. Both, honey and cinnamon are high in antioxidants, which improve heart health. Polyphenol antioxidants boost blood flow to the heart and prevent blood clots, decreasing the risk of heart attack and stroke. They also prevent heart disease as they fight chronic inflammation, which is a major factor in the development of heart disease. The mixture of honey and cinnamon treats digestive issues such as stomach gas, constipation, ulcers, and gastroenteritis. Honey destroys H.Pylori, a stomach-ulcer-causing bacteria, while cinnamon relieves gastroenteritis (food poisoning) caused by bacterial infections in the stomach. The fructose and glucose from honey are easily transported into the blood and used as energy in the metabolism of food, and the long carbohydrate chains, oligosaccharides, have pre-biotic effects that activate helpful bacteria in order to help digestion. The potent anti-inflammatory properties of honey and cinnamon treat rheumatoid arthritis, relieve pain, and fight inflammation. This combination has also been shown to help in the fight against excess body weight. One 2017 study found that the compound cinnamaldehyde activates thermogenesis, state in which the body creates heat and burns calories. Another 2011 study showed that by replacing sucrose with honey, one can prevent obesity, as it activates hormones that suppress the appetite. Nation of these two ingredients has strong antimicrobial properties and prevents the colonization of bacteria on the skin. 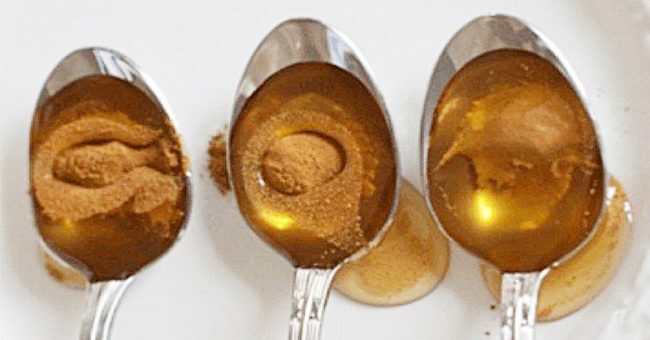 Also, you should mix 3 tablespoons of honey with 1 teaspoon of cinnamon and apply this paste on the ace overnight to fight acne. Therefore, start using honey and cinnamon together, and reap all their health benefits!